The search for new particle physics may entail building a successor to the Large Hadron Collider consisting of a 100km-diameter cyclotron capable of smashing subatomic particles together with 10 times more energy than the LHC. The Future Circular Collider (FCC) commission, involving 1300 contributors from 150 universities, research institutions and industrial partners, has published its four-volume Conceptual Design Report (CDR), detailing the technical challenges, cost and schedule for building the proposed device, which it hopes would discover a new class of subatomic particles involved in mediating the forces at work in the universe. The CDR is part of a roadmap to be drawn up by particle physicists as an update to the European Strategy for Particle Physics. Over the next two years, the scientists will decide how to continue their research after the Large Hadron Collider. The FCC is not the only plan to be considered: another option is a large linear collider, known as CLIC (compact linear collider). The CDR has taken four years to compile. It envisages constructing a new circular tunnel beneath CERN and installing a new magnetically-driven particle collider, equipped with detectors similar to those already existing at the LHC. 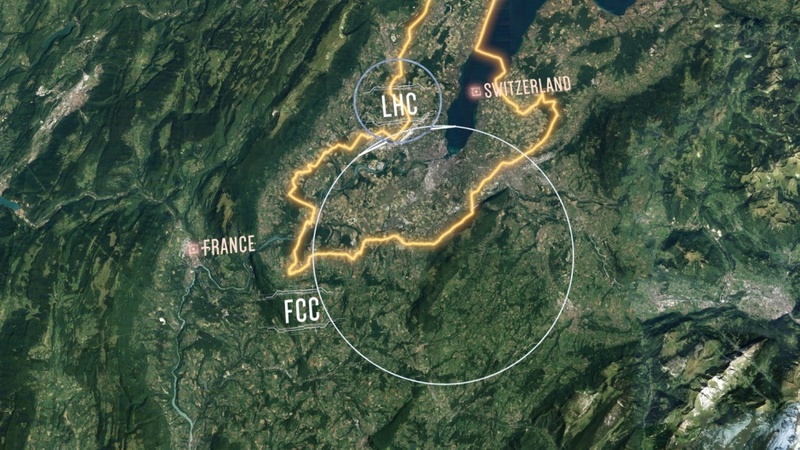 “The FCC’s ultimate goal is to provide a 100-kilometre superconducting proton accelerator ring, with an energy of up to 100TeV, meaning an order of magnitude more powerful than the LHC”, said CERN director for Accelerators and Technology, Frédérick Bordry. The higher energies are hoped to enable FCC to generate particles demonstrating physics beyond the Standard Model, the theory which explains the composition and behaviour of matter and forces through the interactions of a family of 17 particles, the last of which – the Higgs boson – was predicted in the 1960s and finally discovered by the LHC in 2012. Since then, however, the instrument has not discovered any further particles, despite physics discoveries that cannot be explained by the Standard Model, including the faster-than-expected rotation of galaxies, the exhilarating expansion of the universe and the workings of gravity. Physicists have not yet predicted what particles must be responsible for these effects, and therefore do not yet know what energies might be needed to create them in particle collisions. The FCC and CLIC proposals are therefore aimed at creating a variety of collisions. “The FCC timeline foresees starting with an electron-positron machine, just as LEP (large electron positron collider) preceded the LHC. This would enable a rich programme to benefit the particle physics community throughout the twenty-first century,” Bordry explained. FCC would be a very costly project. The CDR says that it would cost some £20bn and will take around 30 years to build, with experiments starting in the 2050s. Critics state that the science community should have other priorities. The BBC quotes Prof Sir David King, former chief science adviser to the UK government and still a senior adviser on large science projects to the European Commission, who believes that climate change presents a more pressing and urgent challenge. I think it entirely correct that we spend money on this type of research. We do not know where it will lead to in the future but that is no reason to say it is a waste of time / money to spend it. Everything that leads to a better understanding of our world is of benefit somewhere. There will always be other projects that are of immediate interest but this does not make it wrong to spend on this type of research. While I can claim no understanding of nuclear physics and am bemused by the particles found, the search for understanding of these is fundamental to human development. This is also true of space exploration. Thus we must invest some of the wealth that is created in these activities. Having visited CERN twice and been truly excited by the scale and quality of the engineering and science involved plus the international co-operation that is vividly apparent, I believe that this is essential development. It is a pity to not that David King is continued to be misguided by the prophets of climate doom in his criticism of the costs. So-called “Climate change investment” has already weakened the EUs economies for no reduction in CO2 emissions (they continue to increase). Nor has there been any noteworthy changes in global temperatures. This squandering of resources is already costing the UKs electricity users billions per year in subsidy costs, and driving manufacture away from the UK. I suppose we could always buy a couple more aircraft carriers …..
Ah, Alchemy lives on, let’s see what we can make for £20bn, should be in Euro’s anyway. Why build it in Switzerland and France, it’s mostly rock there, build an even bigger one in the desert in Australia, very old continent, very geologically stable. I am usually in favour of the big science projects, given that the bill is usually small compared with defence budgets. However the scientists haven’t done a great job of justifying the need for this, the rationale seems to be to build this thing and hope it throws a spanner in the works of physics. The goal of the LHC was clear, find the higgs boson, but building a bigger version after just 7 years in the hope of finding something nobody has predicted is like saying we should land on the moon, but we don’t know where the moon is or even if it is there at all.